Pat Braden is a bit of a local legend. Well-known, respected, talented. The stories in From the Fire were originally created as bedtime stories for his daughters. I add these facts as a bit of a disclaimer. My thoughts on this book will be somewhat reserved. In the growing season, the day begins with a healing, cleansing rain until the morning sun wipes away the mists into the bluest of skies of a new day. From the Fire consists of 6 stories, fables essentially, about a songbird, buffalo, wolves, musk ox, and a beluga. There are a few morals to take away but the predominate theme to me was of perseverance. The innocence of the animals, Terry Pamlin's simple but stylistic line drawings, the wholesome messages; a parent and child could do far worse than these tales. 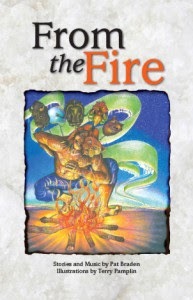 From the Fire also comes with a CD with audio recordings of the stories narrated by other notable locals and with a soundtrack composed by Pat Braden himself.